This is a story about how a community in North Carolina is diversifying its local economy and working toward achieving long-term stability and prosperity through entrepreneurial businesses that focus on the arts and environmental sustainability. The hub of this new activity is the town of Star in Montgomery County, where a couple decades ago the textile mills that formed the backbone of the local economy started to go south and the jobs didn’t come back. In this second post, I discuss how the activities at STARworks mesh with the academic planning and economic development literature. 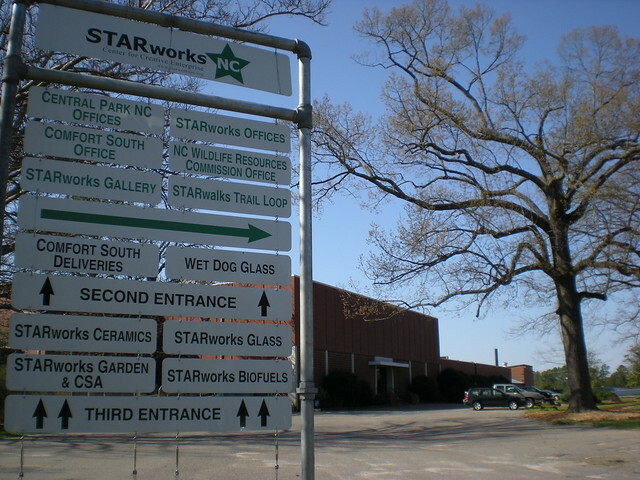 The policy director of the Business Alliance for Local Living Economies, Michael Shuman, visited STARworks in October of 2009 at their annual meeting, an event I also attended while conducting research for my master’s project. Shuman told me he was impressed with what he saw at STARworks. He’s written several books about what he terms sustainable local economies — places that can gain from lessening their courtship of so-called footloose branch plants (subsidiaries of a larger corporation, with fewer locational constraints, and thus the ability to uproot freely from a community) — and replacing imports and exports with homegrown enterprise. Some scholars say that homegrown and locally owned enterprise can, in economic speak, maximize economic multipliers and reduce leakage. (Economic leakage includes imports, as well as savings and taxes — the non-consumption uses on income that do not recycle in the local economy.) The result can be a stabilizing effect on communities. Scholars and practitioners also tend to emphasize building up homegrown enterprise around existing cultural, historical, or ecological resources. For example one practicing planner, Kaizer Rangwala, believes an economy that is “local, participatory, sustainable, and enduring,” is more resilient to economic cycles or decline and gains a competitive advantage from unique local qualities that are difficult for competitors to replicate. Likewise, scholars of rural development see opportunity in the creative economy. Ann Markusen, for example, argues in a 2007 paper that arts-based strategies can provide a robust path for growth in rural economies for several reasons. Artists increase the attractiveness of a rural area to retirees or other new residents. Artists spend locally even when the work is exported, thus local arts-related spending can be viewed as a form of import substitution. Also, arts-related capital spending is believed to have a bigger relative multiplier in rural communities – meaning that the provision of infrastructure for art-based enterprises can be impactful. In recent research, Markusen documents how making a region more attractive to artists can also contribute to growth in spending in related sectors. As this (admittedly incomplete) digest of recent scholarship indicates, the strategies of small, creative business incubation, and the promotion of locally-driven economic activity, are important areas of inquiry for economic development research and practice. For me, STARworks provided another opportunity to see how such strategies develop and evolve. In the next post, I’ll delve more into how they’re doing it.